This is not the first time Hicks has suggested a fundamental change in the way the DVSA monitor fleet operator compliance. In December last year she spoke at the BVRLA (British Vehicle Rental and Leasing Association) industry conference, where she spoke of “Next Generation Enforcement” and the DVSA aspiration of 100% compliance not only with HGV operators, but with all vehicle operators. Referring to the independent research carried out into the current culture within the road transport industry Hicks discussed the current enforcement model and why this dated system is no longer cost effective. 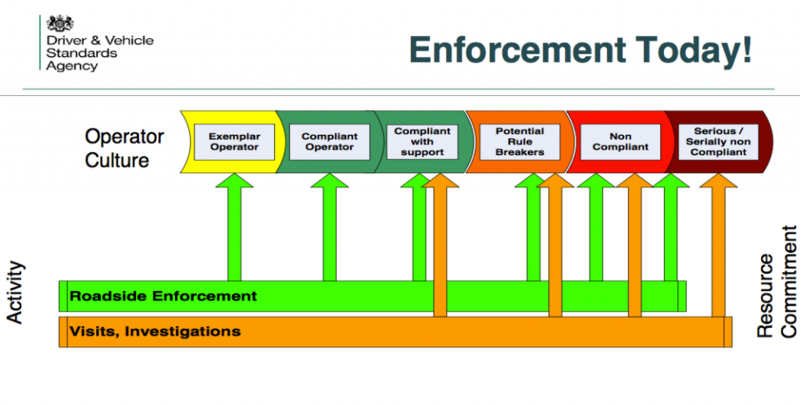 The current enforcement model is out dated and no longer cost effective. The DVSA currently conduct approximately 10,000 roadside inspections every month and Hicks confirmed that the cost of a single roadside inspection to a major haulier could be in the region of £4000. Roadside inspections are intrusive and leave most exemplar and compliant operators feeling disenfranchised with the enforcement process. The image below is taken from the presentation made by Hicks at the BVRLA industry conference and shows how all operators are currently targeted at the roadside. The DVSA propose to completely transform the enforcement model with an operator recognition scheme similar to FORS (Fleet Operator Recognition Scheme). The exact workings of this scheme lack details at the moment however Hicks has alluded to a “light touch earned recognition scheme” for those who are compliant and a “focused targeting regime” for those who fall into the seriously non-compliant category. The image below is taken from the presentation made by Hicks at the BVRLA industry conference and shows how the DVSA propose to shift from enforcement to compliance. Are you ready for next generation enforcement? 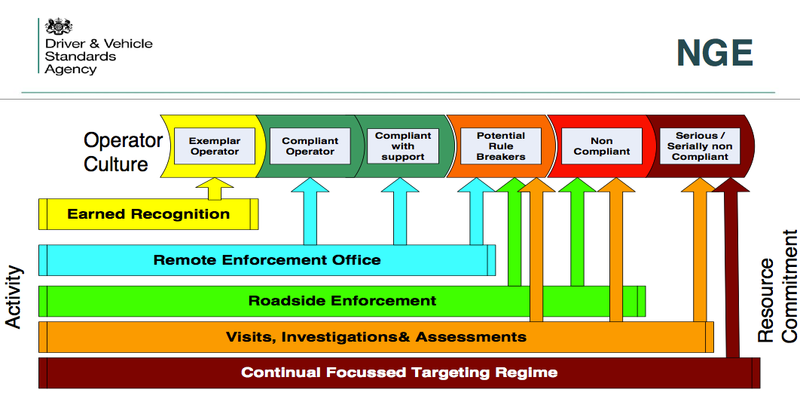 At the moment very little is known about exactly how the DVSA plan it implement and control this recognition scheme and how this will tie in with your OCRS (Operator Compliance Risk Score). However it is expected that the DVSA will be asking operators for significant access to a selection of their records, such as maintenance, tachograph and working time, in order to verify their compliance and position the operator correctly in the new scheme. For many operators this could mean big changes in the way they currently keep records in order to provide these to the DVSA digitally as well as additional administration time to ensure all records are kept updated on a regular basis. However the potential savings by avoiding the need for roadside checks for all those in the exemplar to compliant with support categories will be worth it in the long run. Almost 2 years since the scheme was first proposed the pilot has been announced and is expected to begin in the Autumn 2017. 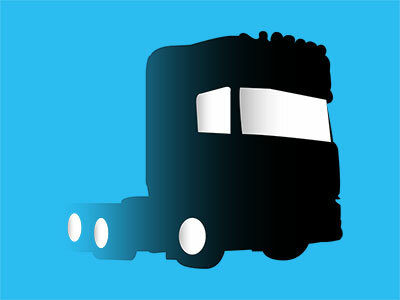 What has now become clear is that the DVSA will monitor compliance in two ways. Independent Audits – In order to gain approval operators will need to successfully pass an initial independent audit. Based on the findings of this initial audit an operator may be given ‘Earned Recognition Status’. Follow up audits will be scheduled at least every 2 years depending on the data provided by the operator in the interim period. Data Reporting – The DVSA have set rigid KPI’s (Key Performance Indicators) which will need to collated, analysed and reported digitally to the DVSA every 4 weeks. In order for operators to provide the data required to the DVSA they will need to invest in a suitable IT system and keep it updated with the relevant records to ensure they remain compliant. So far the additional requirements will come at a cost to the operator however the DVSA are confident that the benefits of remote enforcement for those who are compliant with far outweigh the cost.